Many of our blog readers are getting confused in between the latest launched Government Social Security Schemes Pradhan Mantri Jeevan Jyoti Bima Yojana (PMJJBY) and Pradhan Mantri Suraksha Bima Yojana (PMSBY). 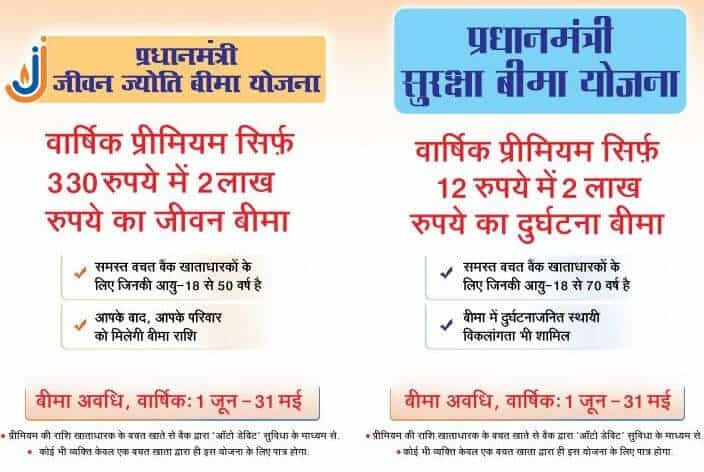 Since both of the schemes offer same insurance coverage with same mode of payment, people are not getting clear picture of the benefits of the schemes. In this article I have tried to clarify the difference between both the schemes by putting it in a tabular form. 3. When to Join the Scheme? In any year after giving the premium subject to the age. In any year after giving the premium subject to the age. 13. Risk Period 1st June to 31st May every year. 1st June to 31st May every year. 14. Mode of Payment Premium will be auto debited from account in the month of May every year. Premium will be auto debited from account in the month of May every year. 1. The form with permission to auto debit the premium amount is to be given every year by 31st May. 2. Along with the joining form, subscribers are also required to submit self-certificate of good health in the prescribed proforma. 3. In case the subscriber is opted for both the schemes then the total insurance cover in the event of accidental death is Rs.4 lakhs. 4. In case the subscriber is opted for both the schemes and dies due to natural death then the total insurance cover would be of Rs.2 lakhs. 5. If the premium is not paid on the time due to insufficient balance, the policy can be restored after paying the full amount together with the self-attested copy of good health. 6. Closure of the bank account with which the schemes was joined will result in lapsing of the policy. Nice initiative, every account holder can easily pay,merely by paying total sum ofRs 340 for both the scheme a person can insure his life. thanks modi ji jo ki garibo ke hit ke liye kiya mai ak madham varg ka adami hu jo ki praivet job karke apne rapivar ka kharch chal pata hai . meri 2 beti hai at app se nivedan hai ki c.g nonisurksha yojna ke taht meri 2 no beti ki parhai ka kharch cg govt se avgat karay. Great Initiative by Govt…….however their should always be an online version for fulfilment. It is difficult to visit bank every week especially when they are clueless about things. If one person join APY and doesn’t continue for his poor financial condition is he allow to withdraw his deposit or adjust his premium to a lower pension group ? pmjjbi……What is the maturity payment?What banifet we want after Maturity.Also How many Year complit for Maturity ? Your answer is already in the post…Please refer point#7 for your answer. Thanks for this article because I was really confused and I started searching the difference between among them. So, In conclusion the difference is mainly lies in accidental death and natural death. Am I right? very good scheme for middle class and poor person.now every person of India will be stand on own foot.thanks p.m.
Khoo……bb sundar scheme.Sam janatar jonya adarsha policy.we are proud for this policy.